Regional herbaria and botanists are building an ever-growing number of online and digital resources for the flora of the Pacific Northwest. The Consortium of PNW Herbaria maintains a list of these resources to facilitate access to information for our region's flora. Data files containing the presently accepted scientific and common names for vascular plants, mosses and lichens of British Columbia. The liverworts and hornworts included in the lists are from the North American lists as a B.C. list does not exist. All species include a 7 or 8 character code for use in database applications. In addition, commonly used species synonyms are included to assist in determining the presently accepted name. Species attributes include lifeform, toxicity, weed status, wetland indicator value, rare (red or blue list) ranking, and whether native or exotic. 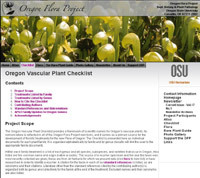 The Oregon Vascular Plant Checklist provides a framework of scientific names for Oregon's vascular plants. Its nomenclature is reflected in all of the OFP web tools, and serves as a primary source for the development of the new Flora of Oregon. The checklist includes all native and exotic species, subspecies, and varieties (taxa) confirmed to grow in Oregon without cultivation, either currently or historically. The checklist also provides synonymy, common names, origin (native or exotic), the source of a voucher specimen, and the year the taxon was most recently collected. A comprehensive and authoritative synonymized checklist of the vascular plants of Washington State. Taxa included in the checklist: native taxa whether extant, extirpated, or extinct; exotic taxa that are naturalized, escaped from cultivation, or persisting wild; waifs (e.g., ballast plants) and other rarely collected exotics; interspecific hybrids that are frequent or self-maintaining; and unnamed taxa in the process of being described. 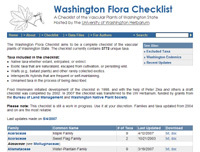 The checklist is expected to provide an essential basis for an eventual updated taxonomic treatment of the flora of Washington. 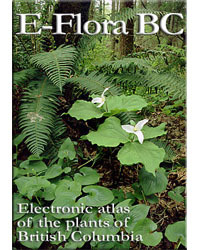 E-Flora BC is a GIS-based biogeographic atlas of the plants of British Columbia that represents new frontiers in information gathering, compiling, visualization and presentation. In taking advantage of the power of the internet and combining it with GIS and statistical analyses, E-Flora BC provides critical information on BC plant species and their ecology. As a "living" atlas of BC plants, E-Flora can be updated on an on-going open-ended basis, keeping key botanical information at our fingertips for use in conservation planning, conservation biology research, and education. The botanical information provided in E-Flora has been compiled from all major botanical sources in the province, representing the work of numerous experts and researchers in the BC flora, in plant taxonomy, in plant ecology and in biogeography. Since 1994, the Oregon Flora Project has been creating a comprehensive resource on the vascular plants of Oregon that grow without cultivation. Founded by the late Scott Sundberg and housed at Oregon State University, the project addresses the 4,516 species, subspecies, and varieties of ferns, trees, grasses, and flowering plants that inhabit Oregon’s diverse landscapes. The Oregon Flora Project uses images, interactive mapping, and descriptive text to convey scientific data to a degree of detail that matches the needs of the user—novice, informed amateur, or professional.Through its collaborative and grassroots nature, the Oregon Flora Project is applying its expertise to complete, curate, and unify botanical information into a resource of great depth and breadth that is valuable to all users. The University of Washington Herbarium at the Burke Museum is producing a new reference manual for Pacific Northwest Vascular Plants, based on the authoritative Flora of the Pacific Northwest published in 1973 by C. Leo Hitchcock and Arthur Cronquist. The original, 730-page, single volume book was designed by the authors to be a portable plant identification manual for professional and amateur botanists. The new Flora will maintain the original's familiar layout, styles, and illustrated keys. Completion of the new Flora is expected to take three years, with a possible completion date of Fall 2016. The new Flora will cover approximately 5,500 taxa, an increase of about 28% over the 4,287 taxa treated in the original. The Oregon Flora Photo Gallery is a searchable online resource provided by the Oregon Flora Project. The Photo Gallery features multiple images of each species, subspecies, and variety of vascular plants that grow in Oregon without cultivation. There is an online image available for 95% of the taxa in the state. There are over 24,000 field photographs depicting a plant’s habitat, its general habit, flowers, and details of important characters. Images of a representative herbarium specimen for each taxon are also available. 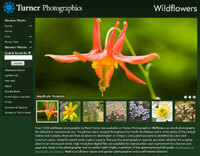 Contains over 7,000 stunning wildflower photographs by Mark Turner. The photos were created throughout the Pacific Northwest and in other parts of the United States and Canada. Most are from locations in Washington or Oregon. Every plant pictured is identified by Latin and common name. Powerful search tools make it easy to find just the photograph or species you want, whether it's a native plant or an introduced weed. An ongoing effort at The Evergreen State College to document the flora of the prairies of south Puget Sound. 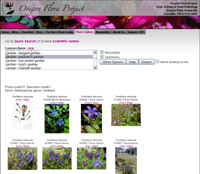 Includes an image gallery with information about prairie plants. 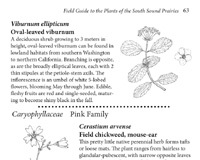 Evergreen students and local experts in prairie ecology are also develoiping a printed Field Guide to the Plants of the South Sound Prairies. A part of the larger E-Flora B.C. web site, the photo gallery contains nearly 10,000 photographs of British Columbia's vascular plants, fungi, mosses, liverworts and lichens. These photos enhance the utility of the species descriptions and atlas pages, and assist with identifying plants you may find in B.C. The photo gallery is continuously growing due to contributions from numerous individuals. 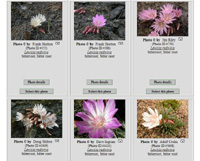 This web site presents a wide variety of Montana wildflowers and other plants growing in the wilds of Montana. Each presented species has its own page with pictures, a full description and, if applicable, information about edibility, medicinal and poisonous properties. 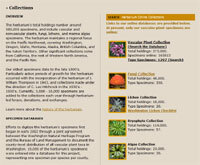 Each presented plant family has its own page with a description of its unique characteristics plus a plant identification online guide with pictures, short descriptions and links to the species that belong to it. The site includes edible plants, medicinal plants as well as poisonous plants. The WTU Image Collection provides online access to over 27,000 photographs, with associated information, for many of the plants and lichens of Washington. Developed and maintained by the University of Washington Herbarium (WTU), this site brings together photographs from numerous photographers and botanists from around the state. Photographs are accompanied by distribution maps, descriptions, synonymy, and additional resources. Use the site to learn about the plants and lichens found across Washington State's diverse array of landscapes. The E-Flora B.C. 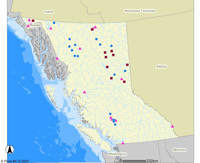 atlas pages contain information on each species in British Columbia, including distribution, taxonomy, ecology, conservation status, poison status, and invasive status. Interactive maps include biogeographic data layers that can be customized to help uncover relationships between plants and their environment. 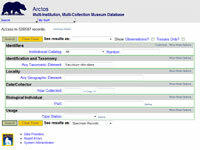 Specimen dots can be clicked to bring up collection information. Animated maps show distributional changes for select species over time. 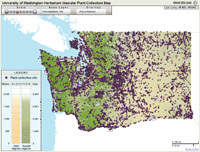 The Washington Weeds mapping tool provides users with access to specimen and/or observation records for noxious weeds, invasive plant species, and all other non-native plants that have been reported from Washington. Observation data contributors to date include King County Noxious Weed Board, Washington State Parks and Recreation Commission, and The Nature Conservancy. The Atlas mapping program allows the user to generate customized plant distribution maps, as well as access information for each plant occurrence. There are ~600,000 mappable records derived from unvouchered observations and species lists as well as specimens from 37 Oregon herbaria, including governmental agencies and small regional colleges. Search results are downloadable, as are lists of associated taxa provided with unvouchered observations. 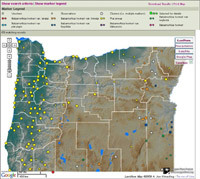 An interactive map of Washington displaying collection localities for all vascular plant specimens in the WTU Herbarium at the University of Washington, providing a way to visualize coverage and gaps in collecting efforts. Locality markers on the map can be selected to view detailed label data for specimens collected at each locality. The Floristic Atlas of the San Juan Islands in Washington State provides an easy to use tool for mapping the distributions of vascular plant species within the archipelago, and for analyzing and comparing species distributions and biogeographical patterns. It is based on historical data and recent, intensive, botanical surveys of many islands by the UW Herbarium's David Giblin and The Nature Conservancy's Peter Dunwiddie between 2004 and 2009. The Washington Carex Atlas provides access to distribution maps for all Carex species known to occur in the state. Multiple species can be displayed together on the map and background map layers can be selected to help detect patterns in species distributions. Dots on the map can be clicked to bring up collection details. 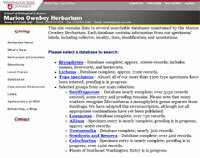 The Marion Ownbey Herbarium at Washington State University provides online access to the type specimens and selected groups of taxa. The type specimen database contains 1,300 records. Databases for selected groups include bryophytes (10,000 records), lichens (2,100), Saxifragaceae (5,150), Loasaceae (750), Allium (4,000), Townsendia (300), Synthyris and Besseya (400), and Calochortus (1400). 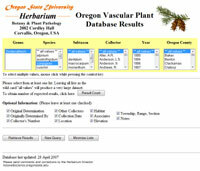 The Oregon State University Herbarium databases provide access to specimen data exclusively for Oregon. Approximately 150,000 vascular plant records are available online, along with about 30,000 mycological specimens. OSU's type specimens (ca. 2,000) are available with high-resolution specimen images and protologues. The Arctos database at the University of Alaska, Museum of the North, contains the combined holdings of the Museum of the North's collections, including the ALA herbarium's specimens. Over 500,000 records are available form the combined collections. Coverage focuses on Alaska but includes many other areas. Specimen results can be mapped using Berkeley Mapper. 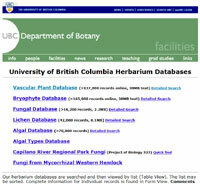 Specimen data from the University of British Columbia Herbarium's specimen collections is available online. These databases provide access to 137,000 vascular plant records, 165,000 bryophyte records, 16,000 fungal records, 42,000 lichen record, and 70,000 algal records. The algal types are also available. Records are included for both within and outside of British Columbia. The University of Washington Herbarium (WTU) provides online access to over 160,000 vascular plant records primarily for Washington and the Pacific Northwest. Nearly 1,300 type specimens, representing most of the types, at WTU are available online and accompanied by photographs of the specimen sheets.